The present printable, downloadable handout is recommended for high school students at Intermediate (B1) and Upper-intermediate (B2) level. It is great for teaching Conditional II (second) - would in English, and is excellent for strengthening your pupils' Reading and Writing skills. 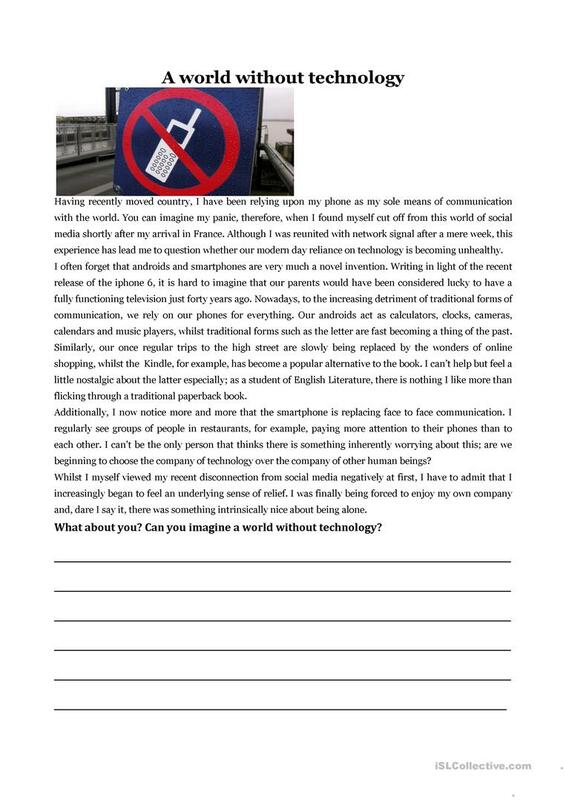 It is focused on the vocabulary topic of Technology. munchkin456 is from/lives in Italy and has been a member of iSLCollective since 2012-02-22 11:24:13. munchkin456 last logged in on 2019-04-16 19:31:22, and has shared 1 resources on iSLCollective so far.